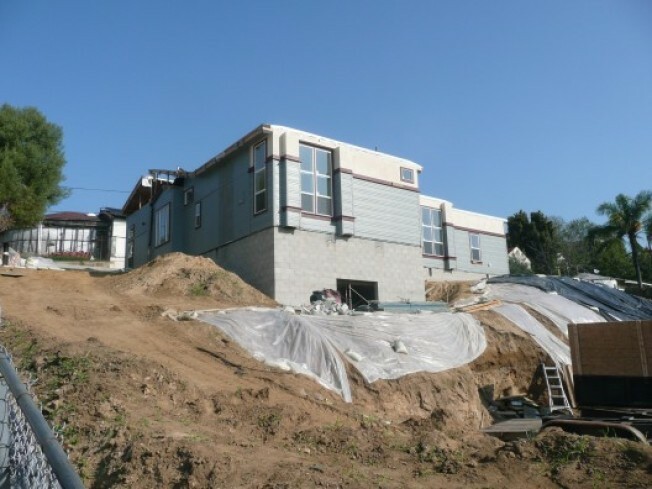 Last week, Eastsider LA pointed out that a new prefab home was rising off Echo Park Avenue. Here's a bit more info: This is a one-bedroom, two and half bath home, consisting of four prefab wooden modules (there’s some stucco), and no, it's not the steel prefab kind of home one is used to seeing from local firm Marmol Radziner, but don't forget that there are many, many styles of prefab homes ranging from fancy to your most basic. The home was manufactured by Silver Crest, a big Corona, California-based manufacturer of prefab homes and the project is the brainchild of Robert Jefferson Construction Design, a home builder based in Oakland, California. Jefferson, who says he has done a handful of prefab homes before, tells us home will be finished in about six weeks (all the modules are done being installed). As for the owner, it’s not clear whether the person who owns the land will sell the home or live in the residence when it's done. As far as costs, Jefferson estimates a prefab home like this probably costs about $300 a square foot, but in this case, expenses like building a foundation on the steep slope and difficulty of accessing the construction site (it's tucked away on a hill) bring up the prices. (Jefferson believes site-building would cost about $400 a square foot.) Comparatively, it can cost $400 a square foot and up for a custom-designed Marmol Radziner Prefab home. Anyway, it's not much to look at the moment now, but in the next two weeks, we'll show off more of the interior of this Echo Park home.